Today we update our statistical work on the relationship between bitcoin’s price and the S&P 500. The notion that bitcoin is a “Stub” asset (the riskiest piece of a capital structure) in global capital markets is getting some traction lately. The idea, in a nutshell, is that crypto currencies are increasingly part of the financial mainstream (numerous haters notwithstanding) and their fortunes are inherently tied to the risk tolerances that support all assets. Higher price correlations should therefore follow, even if bitcoin remains a very volatile asset. The 10-day historical correlations between bitcoin and the S&P 500 reached 0.79 on February 6th, right in the middle of the sharp decline in US stocks. For those of you with a statistical bent, that is an R-squared (coefficient of determination, rather than correlation) of 62%. Not bad for a one-variable model, to be sure. This 10-day measure also shows that the relationship between bitcoin and stocks declined rapidly in the days that followed. By February 21st they had turned negative. As of today, the correlation was just 0.37. 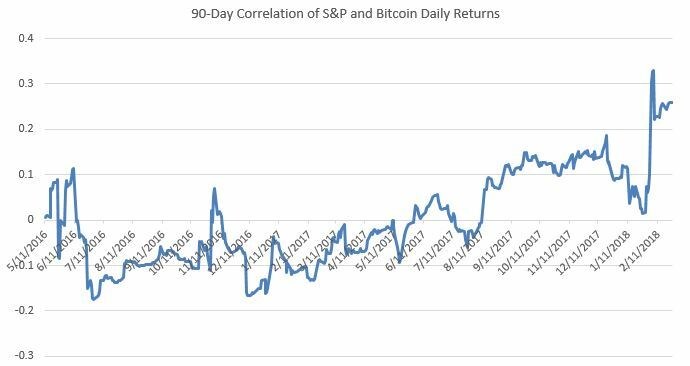 It is also worth noting that 10-day price return correlations between bitcoin and the S&P have been high several times in recent years, and long before it was widely followed by the financial press. Examples include: February 22, 2016 (0.77 correlation), July 14th 2016 (0.80), April 21st, 2017 (0.81), and September 8th (0.80). We’ve included two charts below. 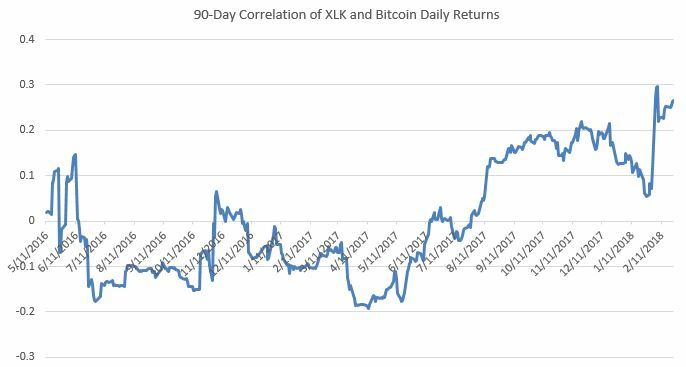 One shows the 90-day correlation between the S&P 500 and bitcoin, the other highlights the correlation between US large cap Tech stocks (using the XLK exchange traded fund) and the crypto currency. With this longer-term timeframe, you can see that bitcoin now shows a much higher correlation to US stocks than for much of the last 2 years (the graph starts in January 2016). The lift-off point was in August 2017 when bitcoin went from a history of almost complete non-correlation to a 0.10 correlation coefficient and (more recently) 0.25-0.30.Statistically minded people will note that this translates only to a 6-9% R-squared. Markets people will look at the chart and say “the trend is not the friend” of considering bitcoin as a non-correlated asset going forward. Since bitcoin is a technology as well as a crypto currency, a comparison between it and US large cap Tech stocks is also worth a look. The data shows essentially the same relationship between bitcoin and US stocks, although a modestly tighter fit during last Fall. Bitcoin seems to track US stocks when they fall (witness earlier this month) more than when they rise. That makes sense to us. A sudden shift in risk tolerances pulls capital out of all risk assets. The same thing happened with gold during the Financial Crisis, when the yellow metal was down in 2008 along with everything else. Over time, bitcoin’s price will be set not by equity prices but by its own fundamentals. The long run correlations show that well enough, and it makes intuitive sense as well.